Nicknames: She’s probably had more than her fair share of insulting nicknames. Species: Vampire with the appearance of a bat anthro. Appearance: She is a bat anthro with very large bat ears, adorably wide eyes with red irises, and cute little fangs. She has average length black hair tied in a ponytail. She wears a plain, short button-up dress and Mary-Jane shoes. Family includes a mother and father, an older brother, a sister-in-law, two nephews, a grandmother, a great-great grandmother, an uncle, a great uncle, two aunts, two great-aunts, and a few cousins. May find a friend in SHUSH Agent Grizzlikov, later. Sunlight, garlic, silver, OCD-like traits with a particular compulsion towards having to stop everything she’s doing in order to count items that end up spilled on the floor (such as a bag of M and Ms), making sure shoes are tied, buttons are buttoned, etc. Other Info: She stems her blood cravings by sucking on blood lollipops. She has no reflection in the mirror and cannot appear in photographs. She speaks in your typical “vampire accent.” She is not affected by holy items due to the fact that she is not an “evil” vampire. Tendency towards childish behaviors (including temper tantrums when she doesn’t get her way, very immature name-calling in response to being insulted: “Oh yeah? Vell, you are a doody-head!”, appears to enjoy playing with toys and dolls), appears to take rules and regulations very seriously, very detail-oriented, adopts very serious demeanor while on the job. Vampires that do not grow past child stage are rare but not unheard of. Maggie was born in a fairly rich family of vampires (nobles of some kind) and as such grew up fairly spoiled and entitled but was also raised under a strict system of discipline where her parents expected nothing short of obedience. Following the rules appeared to be the best way to get what she wanted. She attended a private school for supernatural beings and did fairly well… being one of the most well-behaved students in the class. 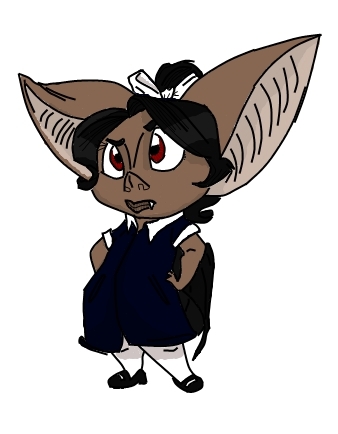 She decided to go into law enforcement after witnessing enforcers from the Council of Mages take down a gang of thieving vampires and werewolves that had been burgalarizing not just from her family’s home but also from the local monster village and the Normal village a short distance away. Her family doesn’t really approve of her choice of work (seeing it as a commoner’s job), but since her prospects of getting married are extremely unlikely, and there isn’t much in the way of alternatives, they don’t berate her for it.